For this post I will be participating in In My Kitchen - November Edition. Of course most of my entries you will see what's been going on in and around my kitchen but I figured this would be a good one to catch up on some random food things! 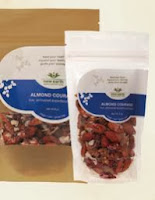 New Earth Superconscious Living Almond Courage. I have to say this took me a while to appreciate and understand! At first I was eating the contents of the bag one at a time. I think I was a little thrown off at the texture of the dried Mulberries...not completely sure but I just wasn't totally loving them! But then I had that Ah-HA Moment! If you eat them by the small handful and not one by one and get all or at least several ingredients in your mouth at once - they overall flavor was much better. More tasty! Complex yet real! This way...I really liked it! This product is vegan, it's RAW, and it dandy to have on hand at the office for mid-afternoons! I think it would be great as a cereal topping, too...but I just like snacking on them! Ingredients include: organic activated almonds, organic sweetened cacao nibs, organic mulberries, organic goji berries, organic coconut chips, organic yacon syrup, organic mesquite pod, organic reishi, wildcrafted himalayan pink salt. Another thing in my kitchen lately are Sesame Sticks. The ones I get come from my local Herb Shop. They are Non-GMO and contain Wheat Flour, Barley Flour, Soy Bean Oil, Sesame Seeds, Bulgur Wheat, Beet Powder, Turmeric, and Salt. These are another great snack or salad topping! Last night we did a Wildtree Tasting Party for a friend. 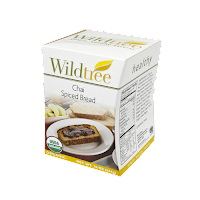 It was the first time we tried to make the Chai Spiced Bread. Actually, my mother made it. It was a HIT! She said it was different from the other breads she has made but in the end the flavor was tasty and there wasn't any left at the end of the night and that's what counts! All you have to do to this Bread Mix as add water! NO EGGS NEEDED! Yessss! I was so happy! The ingredients for this product are located HERE. If you are interested in purchasing this product or any other products from Wildtree PLEASE visit our website/store! 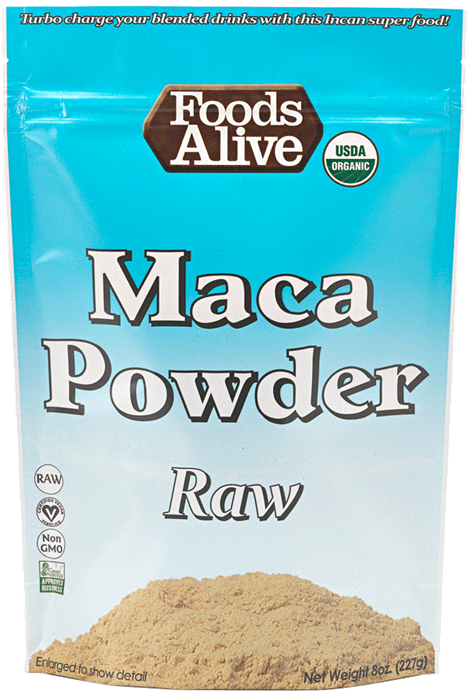 Next Up...Maca Powder from Foods Alive. I'm still a novice when it comes to Maca. I have been tinkering with it a bit and hope to add some success stories to my site soon! This Maca Powder is rich in calcium, magnesium, phosphorous and iron, and contains trace minerals, including zinc, iodine, copper, selenium, bismuth, manganese and silica, as well as B vitamins. It also contains four alkaloids proven in scientific investigation to nourish the endocrine glands. It has a nutty taste, blends well with cereals, ice creams, juices, milks, yogurts, pies, cakes, smoothies, cookie fillings and desserts and can be added to a variety of recipes. 2-3 tsps per day is the suggested use of the powder. It's been a LONG time since I have dehydrated anything in my dehydrator. I think it's because I am longing for a NEW Dehydrator. I really want a square one...not this round one I have from Nesco that I have had for YEARS. Regardless I will be pushing myself to use it more in the coming months. I will certainly report back here with my efforts. Of course, the ultimate would be an Excalibur but I can't see myself spending like 300 bucks on one! I know I have mentioned it before on my blog but it's worth another mention that is for sure! 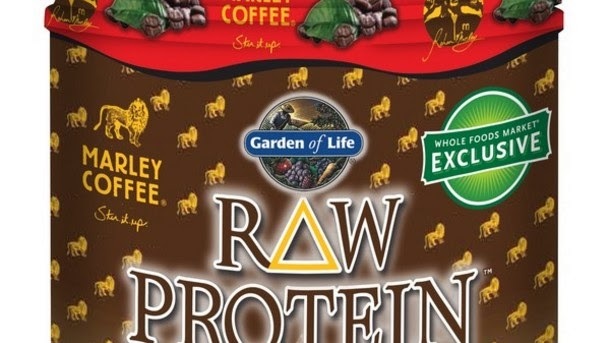 The Raw Protein Marley Coffee Blend from Garden of Life. I'm totally LOVING it and will have more ideas and recipes very soon. So far my favorite quick and easy recipe is a scoop of this in 1 C of Almond Milk (or Cashew Milk) with 2 Tablespoons of Chocolate Peanut Butter from the Peanut Butter Company. But I will say I am super excited about the whole line thus far and will have TONS of ideas in many upcoming posts! I might even start contributing to their blog! VERY EXCITING! This among many other things are what's new and or HOT in my kitchen so far this month! How about you!? I could go on and on about tons of other things, too, but I will save those for future posts! I know almond...but the rest, I've never seen before... Ya, gotta try to live healthy, green and natural too. 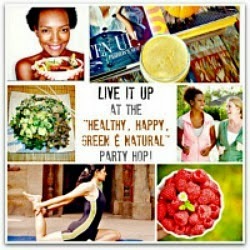 Thanks for the reminder about Happy, Healthy Green & Natural - somehow I had missed seeing it yesterday! That's where I got 'em, actually! My Local Health Food Store! I'm really LOVING that site! I hope to participate often! Well your kitchen looks pretty fun! I especially like the look of the raw maca powder - I don't think I've seen that brand out here. I have an excalibur, my hubby found it on sale - you should look around, I think they have sales fairly often. How great to have you joining in, thanks for playing! So many interesting vegan products in your kitchen - Sandy who posts and IMK blog is vegan as well, as is Johanna from Green Gourmet Giraffe (I think). I'm glad the mulberries were nice - what do they do about the centre stem? We always pull them out of fresh mulberries, so I was curious if they somehow managed to do the same before they dried them? Thanks for visiting! I'll be over to visit you later today! Thanks for the heads-up on fellow vegans from the hop! I will try and check them out! With the Mulberries I noticed some of them the stems were in and some were out...the ones that had the stems in there were fairly short, tho. What interesting and healthy things you have in your kitchen! Himalayan pink salt and dried mulberries, wow. I'm envious of the dehydrator too, always fancy one when I have a glut of plums, apples or other fruit in the garden. Hiya! Thanks for the visit and the comment! I will be over to your place soon! I'm envious of your garden! Plums, Apples, and other fruits in your garden!? Awesome! Wish I was your neighbor! Fun post with some interesting products! I need to try that Raw Protein flavor, I've been getting plain and chocolate from Amazon lately. Oddly - I haven't tried the plain or the chocolate! I have been working with the Apple, tho! Yerba Mate, Marley's, and a few others! 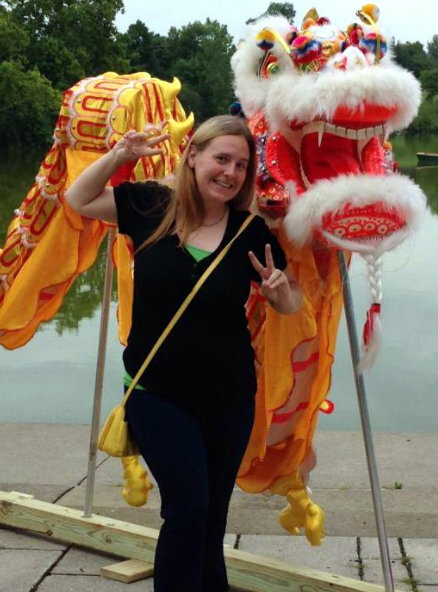 G'day Jennifer and congrats on your first IMK post, true! Love the maca, have some, but have never used and a dehydrator is on my list to do...thanks for this month's kitchen view! Thanks so much for the welcome! I'm still quite new with Maca so I'm looking for different things to do with it! I'll be over to visit you soon! Thanks for stopping by, for the encouragement, and the comment! 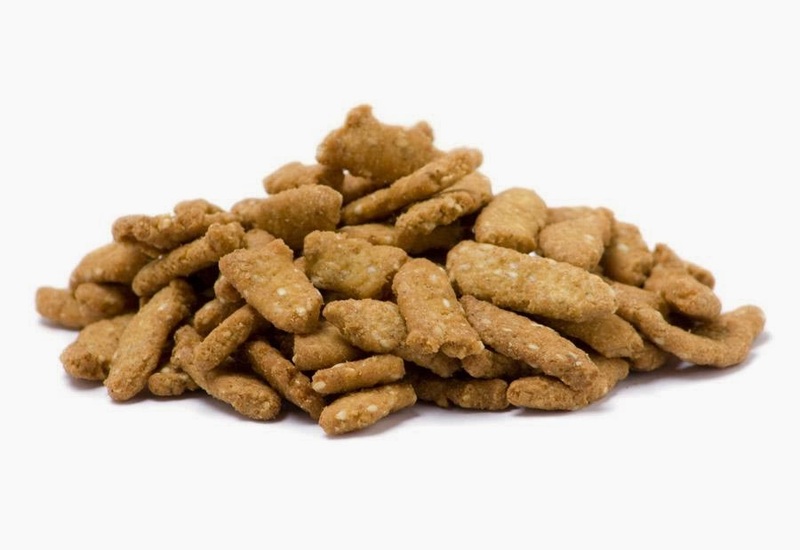 I used to eat many sesame sticks when I was younger. Welcome to IMK. 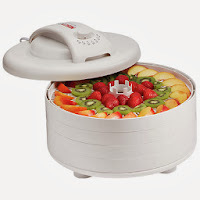 I long for a dehydrator but do wonder about the power bills. Do they use a lot of electricity? And am I contributing to the carbon emissions for the sake of me wanting some crispy zucchini? Anyway, I'll continue to ponder. Thanks for the tour and the intro to a few new food items. I haven't noticed much of a difference in power bills but then again I don't run it every night and for the longest time I didn't run it at all! I'm not sure on the amount of electricity it uses but because it's lower temps I'm thinking it uses less. This is something I will be researching soon! Thanks for visiting and I will be dropping by your place soon! Thank you so much for taking us inside your healthy kitchen and sharing your brilliant post: “In My Kitchen” at Live It Up at the Healthy, Happy, Green & Natural Blog Hop! I sincerely appreciate it! We will all benefit from these helpful tips.